Spoilt. First Class on British Airways, after years of collecting I finally indulged by using my frequent flyer points to upgrade and experience what its like to travel in upper class. Here I am with champagne in hand, warm nuts, pillow placed behinds my head, 30000 feet on a 747 jet to London from Moscow. It’s just a 3 hour 30 minute flight but at least a chance I can indulge in this captive time in the air. Its not everyday one gets these sort if pleasures. My seat is reclined, a double aspect window, semi-private seat to stretch in. Big screen with video on demand. Powering my mobile while I write this. Take off your shoes and and stretch. The dinner service starts with caviar with blinis and Russian Standard Imperial vodka, followed by my choice of seared Scottish king scallop with broad bean puree and crispy porchetta from the menu. The main dish a roasted Herefordshire fillet of beef and braised beef pie with artichoke barigoule (slow roasted and topped with bacon and vegetables) and crispy Iberico ham, a delicous glass of wine, and finally ending with a sweet desert. At this altitude, I’m as near to heaven as can be while alive. The tiny first class bathroom is clean and sparkling, with full length mirror to make sure you look perfect when you arrive. In first you get dedicated magazines not seen behind the curtain. Even the inflight duty free has more options, and of course, higher price tags too. 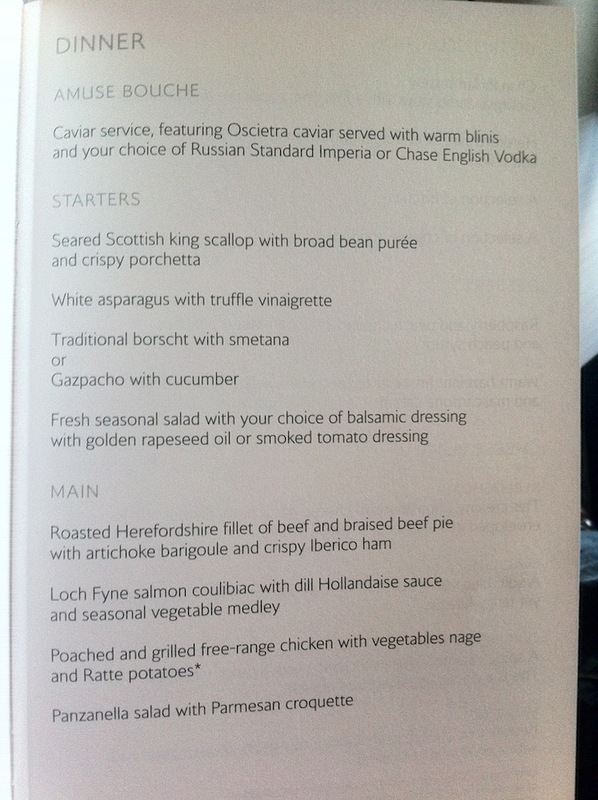 A short flight it was, but very comfortable and excellent taste of first class onboard British Airways. Definitely a mile-high experience.